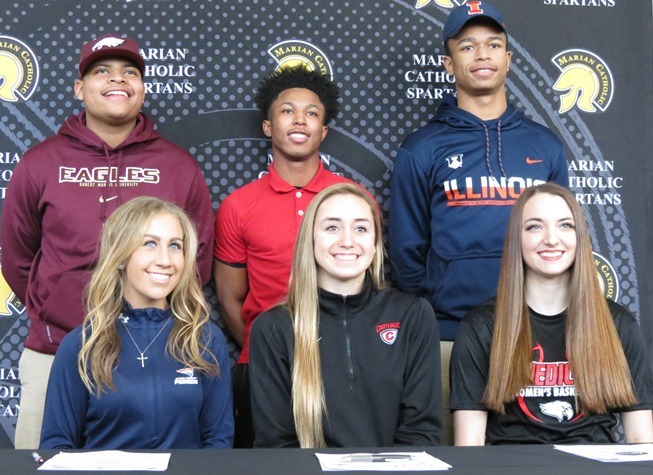 The East Suburban Catholic Conference sends several quality student-athletes onto college each year. Following is a listing of Class of 2017 ESCC Athletes who have committed to continuing their careers at the next level. Marist High School held a late spring signing for college commitments. 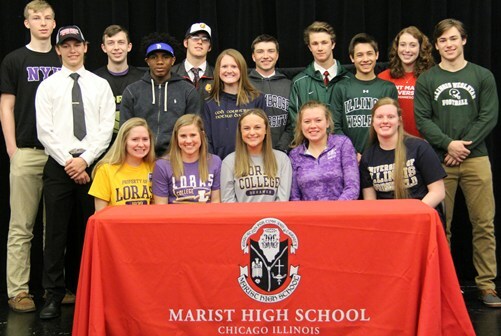 Marist High School had 16 students commit to college on the April 12 commitment date. 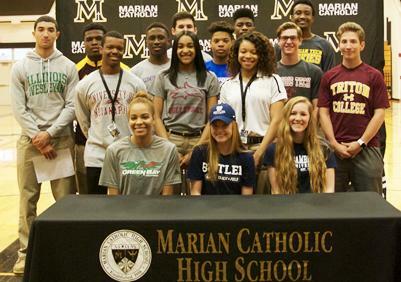 Fifteen Marian Catholic athletes made college commitments on April 12. 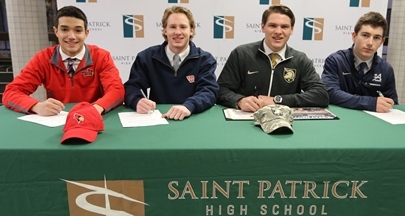 Commitments for Saint Patrick in February include (from left) Andrew Edgar (Illinois State football), Paddy Byrne (Dayton football), Jonathan Hamilton (Army football) and Mike Coughlin (St. Ambrose baseball). Marian Catholic college commitments in February 2017 include (from left) A.J. 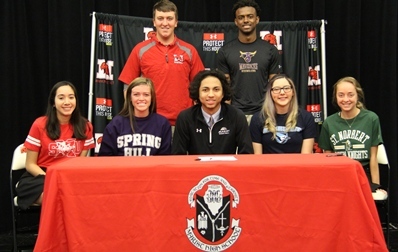 Anderson (Robert Morris baseball, football), Mallory Olszak (Carroll basketball), Jaylen Scott (Monmouth football), Mae Van Beest (Carthage water polo, Cameron Thomas (Illinois football) and Elisa DiOrio (Benedictine basketball). 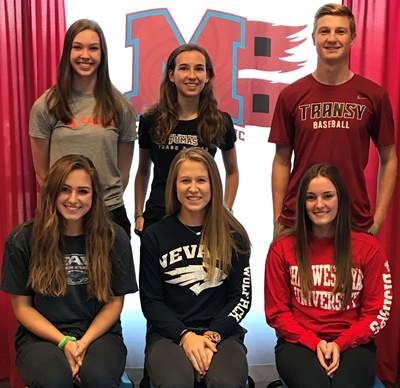 Marian Central November commitments include (clockwise from top left) Rachel Noonan (Carroll volleyball), Abigail Jones (St. Joseph cross country), James Raffauf (Transylvania baseball), Meghan Schwallie (Ohio Wesleyan volleyball), McKayla Wuensch (Nevada-Reno volleyball) and Sydney Nemtuda (Florida Atlantic volleyball). 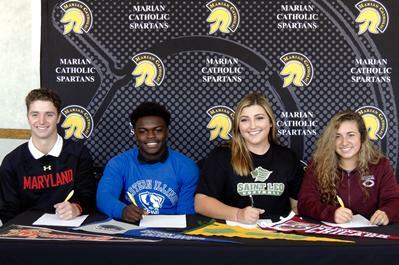 Commitments for Marian Catholic in November included Mark DiLuia (Maryland baseball), Wyell Woods (Eastern Illinois baseball), Danielle Thieman (St. Leo softball) and Gabi Angellotti (Univ. of Chicago softball). 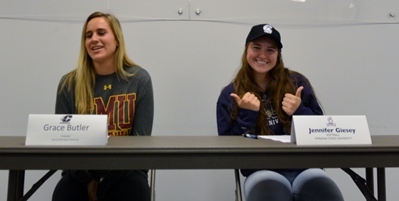 Carmel Catholic signees in November include Grace Butler (Central Michigan volleyball) and Jennifer Giesey (Winona State softball).